Well, I spent a really long time last night working on a long-term wave count for the Dow Jones Transportation Average (TRAN), and then I wrote 4 paragraphs about it. And then I decided to save it for tomorrow, mainly because I want to see how today plays out. So today's update is shorter than I'd originally planned, but tomorrow's update will have more words and technicolor charts, and will be presented in Dolby stereo. Monday's update expected a trip to 1768-1773 SPX, followed by a reversal -- the market closed Monday at 1768.78, then gapped down on Tuesday and shook out the longs who'd come late to the party. The rally from Tuesday's low appears impulsive, suggesting it will have at least one more leg. 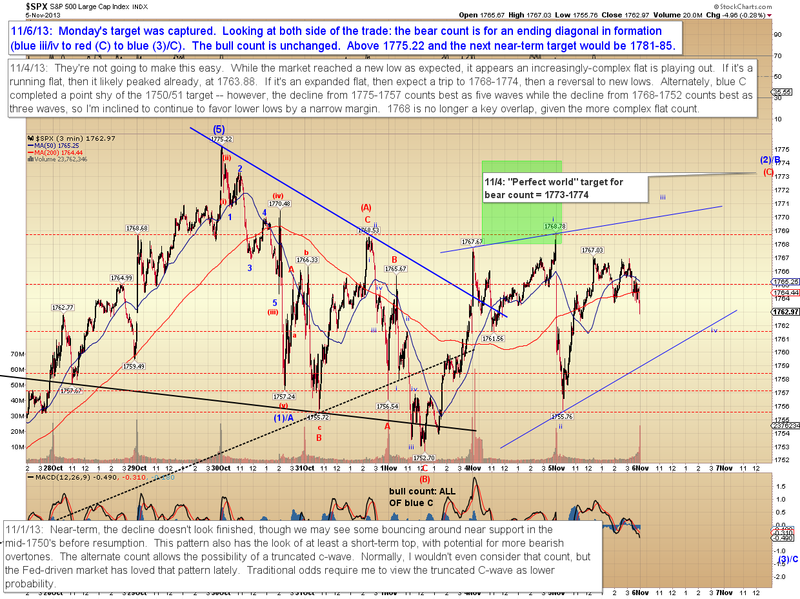 The bull and bear counts both remain valid for the time being, though the bear count has morphed into an ending diagonal c-wave. The all-time-high remains the dividing line. The 30-minute chart is unchanged. One thing on this chart that's a bit questionable for the bull case is the break of the blue trend line. 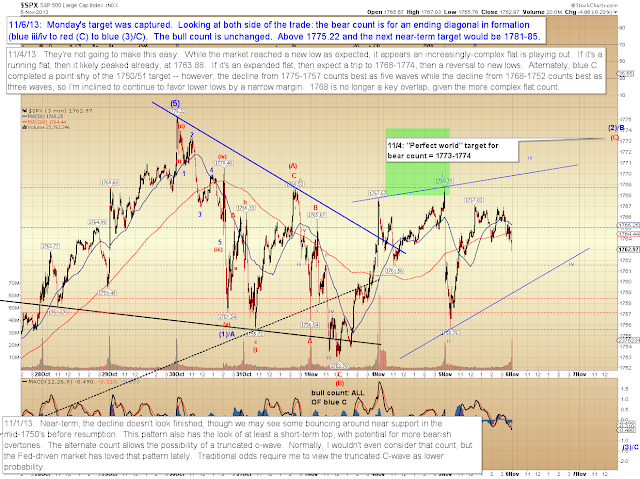 If wave (4) bottomed at 1752, we'd normally have expected to see that trend line hold. It's not impossible for a second wave (it would be wave 2 of "bull count (5)") to break the (2)/(4) trend line, but it happens with lower frequency. In conclusion, SPX has been range bound for about a week and a half, which always gives traders the option to let their imaginations run wild. 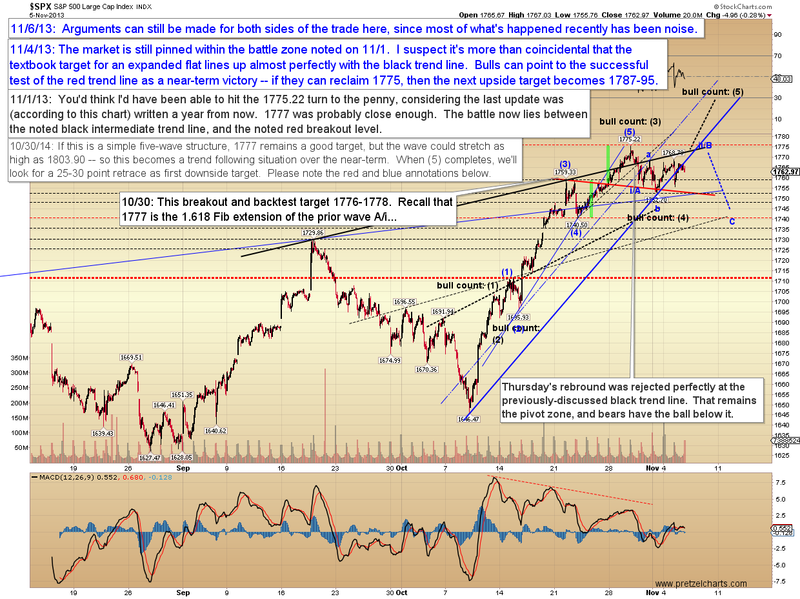 Bulls can view this as a consolidation of the prior uptrend, and bears can view it as a topping pattern. Meanwhile no new information has been conveyed, and the grind continues for the time being. Trade safe. Diabolic precision PL! 99% of what is written away is a waste of time. Do you still operate a live chat room? And yes, forum link at the top of the page. You're all set -- just jump into the discussions at any point, it's a great group!